Hickleton is an 18 hole undulating parkland course, designed by the famous Ryder Cup players Neil Coles and Brian Huggett. It measures 6446 yards off the back tees and is a fair and enjoyable test of golf for both the competitive and social golfer alike. The original 9-hole course was founded in 1909 with the current 18-hole layout opening in 1976. Since this time, the course has developed into one of the finest and challenging courses in the South Yorkshire region. The course has many tree-lined fairways and fantastic panoramic views over South Yorkshire and the eastern Pennines. In the words of many visitors to Hickleton "a superb course with magnificent scenery." A major feature is the tree-lined stream that runs through the centre of the course which opens out into a lake at holes one, two and ten. The course's superb condition and excellent design are Hickleton's major assets along with the fantastic panoramic views, which can be enjoyed from many areas of the course. 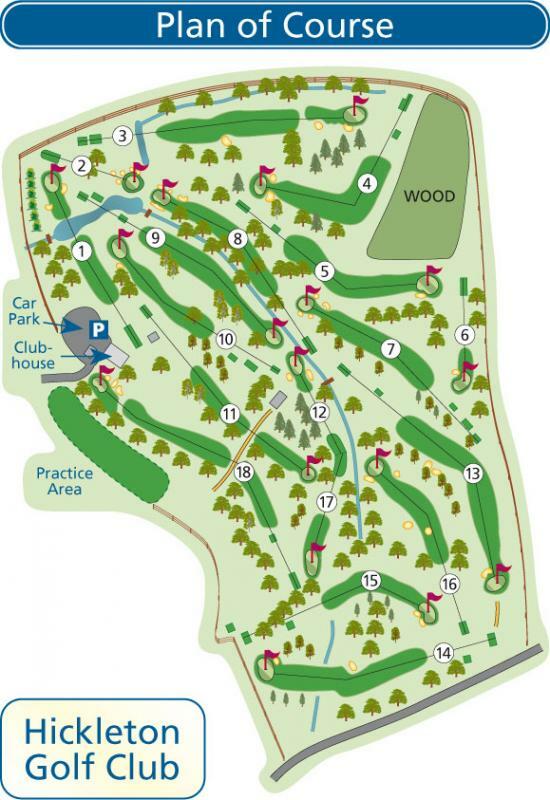 Please see below detailed descriptions and visuals of the 18 holes. You can also read the helpful tips from our resident PGA professional, Sam Law. Click on the graphic (provided by Birdie Golf) for more information. A gentle starting hole with a lake situated about 230 yards from the back tee. The careful player will lay up short of the lake with a mid-iron, but the brave amongst you may take on the challenge of the lake with your first shot. The green slopes from back to front and is protected by bunkers to the left and right. Pro's tip: Lay up short of the water off the tee for a short iron approach shot up to the green. A short downhill par 3, with the green protected by pot bunkers to the front and left and a watery grave awaits any ball which is hit to the right and beyond the green. A hole which is tougher than its designated stroke index. Pro's tip: This hole plays downhill so be careful with your club selection. A challenging par 5 with out of bounds all the way up the left hand side of the hole, however the wide fairway enables players to open their shoulders for the first time. A blind second shot needs to be threaded between a fairway bunker to the right and a hedgerow to the left. A large, shallow bunker to the right protects a large flat plateau green. Pro's tip: A tee shot aimed towards the fairway bunker is safe. Longer hitters may go for the green in two but run the risk with out of bounds left. A sharp dogleg right, which requires an accurate tee shot to enable you to approach the narrow green from the fairway. The narrow but long green is protected at the front by two bunkers to the left and right. Pro's tip: Play a shot to the corner for 150 yards into the green, longer hitters can cut the corner with an iron or fairway wood. A sharp dogleg left hole where another accurate tee shot is required to find the elbow of the dogleg, which is between Spring wood and a row of hawthorn trees. A large, deep bunker to the right protects an elevated McKenzie green. Pro's tip: Anything right hand side of the fairway leaves a clear shot to the green. Remember to club up when hitting this double tier green. A very testing par 3 with out of bounds running along the left hand length of the hole and a steep wooded embankment to the right. A bunker at the front right protects the green, however, when you do land on there fantastic views across South Yorkshire and beyond can be enjoyed. Pro's tip: Tricky par 3 due to the blind green. Check the colour of the flag to work out the yardage and club up. A straightforward downhill par 4 with a tree lined narrow fairway, a good drive usually sets you up for a par 4 or better, however a stray second shot may find one of the four bunkers which protects this small green. Pro's tip: A good tee shot onto the fairway makes the approach to the green, protected by bunkers, a lot easier. Try to aim for the right hand green side bunker off the tee. As the stroke index suggests, a very difficult hole which requires a straight, long drive to enable you to reach the green in two. A wooded stream runs the full length of the left hand side of the hole and four bunkers protect the large green. A par is a good return on this hole, which is amongst the toughest on the course. A relatively straightforward par 5 for the ladies. Pro's tip: Sweeping dogleg to the left. Try to play for the right hand side of the fairway off the tee for the desired approach shot. What a way to finish the outward nine, a tough, long par 4 where a good drive leaves you with a long, blind second shot. The left of the hole has a water hazard running along its full length and the right of the fairway is protected by trees. No bunkers required on this hole, which in the opinion of many of the members, is the toughest hole on the course. Pro's tip: A long hole uphill. Blind second shot to the green so take a club or two more and aim for the white post. A large ash tree that stands in the centre of the fairway has to be negotiated with the drive. A good drive leaves you with a short to mid iron downhill shot to a large green which is protected by a sand bunker to the left and a grass bunker to the right. A long second shot may find the lake which is to the rear of the green. Pro's tip: A good tee shot over the tree is required to leave a downhill approach shot to a narrow green. Better to favour the left hand side off the tee. An undulating uphill fairway awaits the straight hitter with thick rough both left and right. Out of bounds on the left comes into play whilst taking your second shot to the smallest green on the course. The green is cut into a right to left slope and proves very difficult to hit. This hole is a relatively straight forward par 5 for the ladies. Pro's tip: Aim at the pole in the middle of the fairway off the tee as trouble left and right. Blind green so check the yardages and trust your club selection. A picturesque par 3 which is dominated by an old hawthorn tree, which stands about 80 yards from the tee. A wooded stream runs along the right-hand side of the hole and captures many a stray tee shot. Two bunkers both front right and mid-left protect one of the largest greens on the golf course. Pro's tip: Downhill par 3 with a water hazard right of the green. Aim at the left hand side of the green to play safe. A left to right par 5 with an inviting uphill tee shot to a wide fairway with two large bunkers strategically placed about 250 yards from the tee which capture the longer hitter. A blind second shot across the corner of the elbow places you in mid to short iron range to a green which is cut into a left to right slope and is protected by a deep bunker front right. Pro's tip: Par 5 that plays longer than its yardage up the hill. A tee shot aimed to the left hand side of the fairway will feed in off there. The approach shot wants to be aimed left of the green side bunker. Longer hitters may reach in two off a good drive. The most difficult hole on the course which commences at an elevated tee and finishes at a narrow elevated green with the second shot being played from the valley bottom. The tee shot has to be accurate as a bunker lays in waiting at 220 yards. It is out of bounds all the way down the left and a dyke protrudes out into the fairway at 250 yards. A uphill second shot to the elevated green with out of bounds immediately behind. An under hit shot is usually punished by the ball rolling back down the fairway. Pro's tip: Downhill tee shot to be played short of the ditch to leave an uphill second to a narrow green with out of bounds only yards over the back. A short par 4 played from an elevated tee, which has panoramic views across the golf course. The hole is protected by plantations of trees to the left and right of the fairway. Two large bunkers to its right protect the long, elevated green. A good, short par 4, which is becoming increasingly more difficult with the development of the plantations. Pro's tip: A solid tee shot will leave lower handicaps a wedge in. It's all about distance control when hitting to this long but narrow green. Probably the easiest par 4 on the course. The hole is a slight right to left dogleg which in the main is downhill. The tee shot is blind, but beware the fairway bunkers at 203 yards and 232 yards. If you avoid these a simple, short iron shot is required to a large, flat green which is protected by bunkers left and right. Pro's tip: Over the pole for short hitters, to the left for longer. This hole suits a draw off the tee. A good shot leaves an inviting approach to the green. The longest and toughest of the four par3's. The hole is slightly uphill and a good tee shot will reach a rolling green which will test the putting ability of all golfers. Most players are happy with a par on this testing hole. Pro's tip: Tough par 3 uphill with a long sloping green back to front. Check where the pin is and take plenty of club. The longest and best of the par 5's. The hole presents you with a demanding right to left tee shot to a sloping fairway with woodland to the left and semi-mature trees to the right. The second shot is blind and a large ash tree in the centre of the fairway has to be passed by, either to the left, right or straight over the top. If you have safely negotiated the tree then a short to mid iron is required to hit the green, which is protected by three deep bunkers to the right and a small, sharp diagonal embankment running across the front . All in all, an excellent finishing hole. Pro's tip: Off the men's tee a shot over the ladies' tee with a little draw is perfect if you can play it! Deep bunkers guard this green short.